Shaker Kitchens Warrington supplied by Alexanders Kitchens. 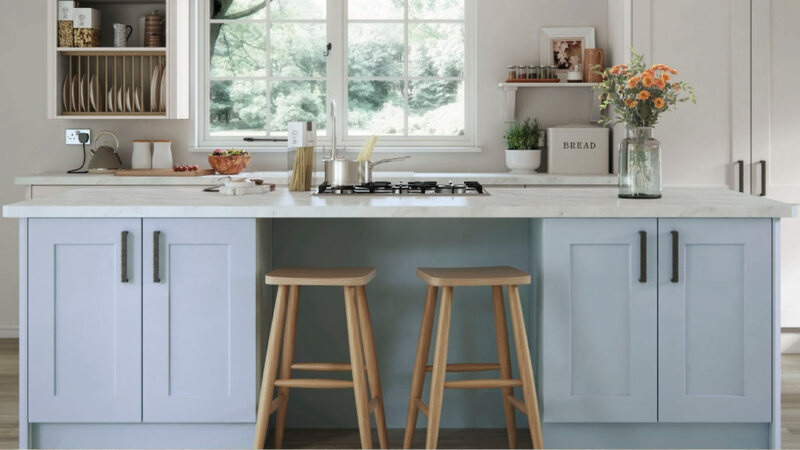 Painted shaker kitchens in a wide selection of bespoke colours. The classic shaker style kitchen design is still going strong and the most popular choice amongst the general public. If you want a timeless classic look with the versatility and options of colour this could be the door for you. Painted Shaker kitchens are the basis for all classic kitchen designs. A shaker style kitchen looks solid and holds its appeal over time while maintaining interest in the slightest of details. 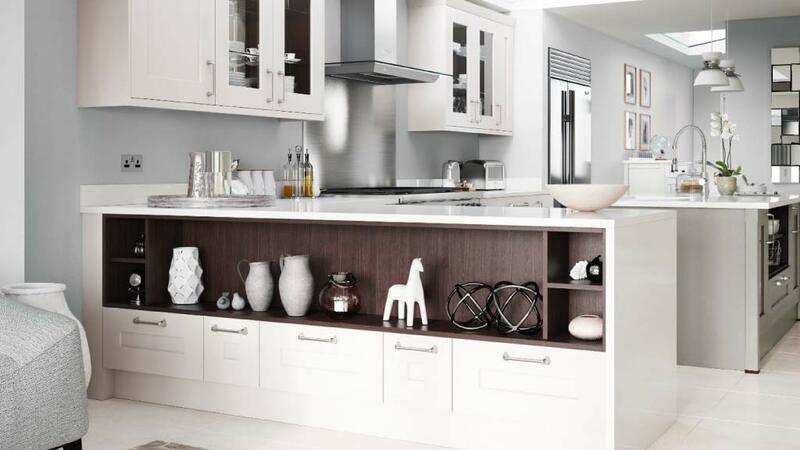 At Alexanders Kitchens Warrington we offer an exceptional selection of shaker kitchens to choose from. Select one of the many standard colours or pick from an unlimited array of bespoke painted shaker colours. Find the exact scheme to suit your home. Where Do Shaker Kitchen Designs Fit In? Shaker Kitchens look great in many different settings, cottages, barn conversions, even the modern day home. The influence of the shaker style can still be seen mirrored in kitchen appliances and their design today when you look at a modern oven. The shaker style has been so successful at adapting to its surroundings. A simple change of handle choice can transform this kitchen style. A handle can take a cottage kitchen feel to a modern classic kitchen feel in the blink of an eye. 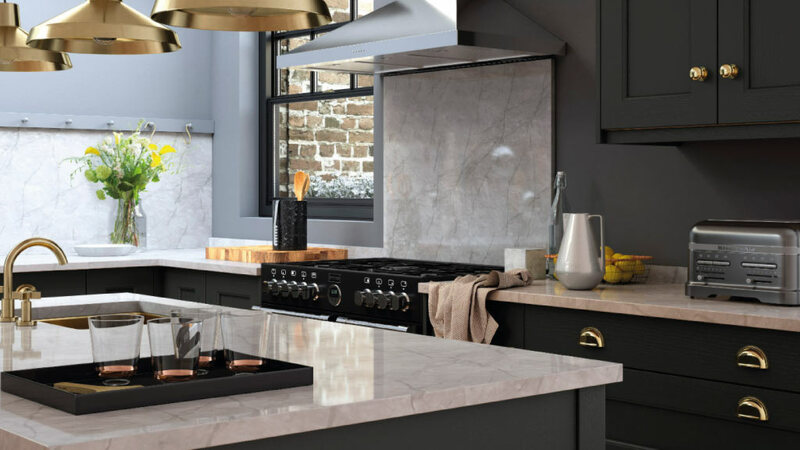 Most likely the reason that shaker kitchen doors have survived all trends and maintained the highest numbers across decades of kitchen design since it’s arrival. Solid wood shaker kitchen doors have all the hallmarks of a standard shaker kitchen style with one notable difference, wood grain. When you look look at a solid wood shaker kitchen whether it is sanded oak and oiled or it is painted, there is an undeniable look of quality about the unique solid wood grain detail that is hard to replicate. Usually of five piece construction, shaker kitchens are the modern day “Standard” first choice when selecting a kitchen door style. Sturdy looking and heavy the shaker door says quality and durability. 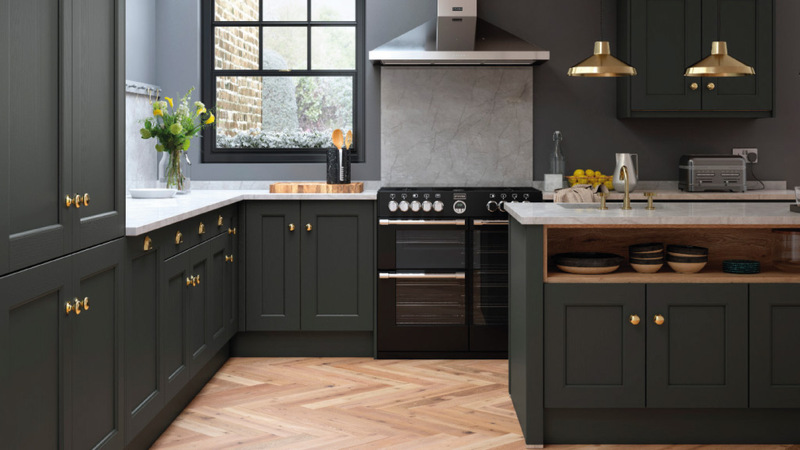 Being robust and ready for work is what this door does best but not at the cost of classic aesthetics and not at the numerical cost of the more decorative In frame Shaker Kitchen. 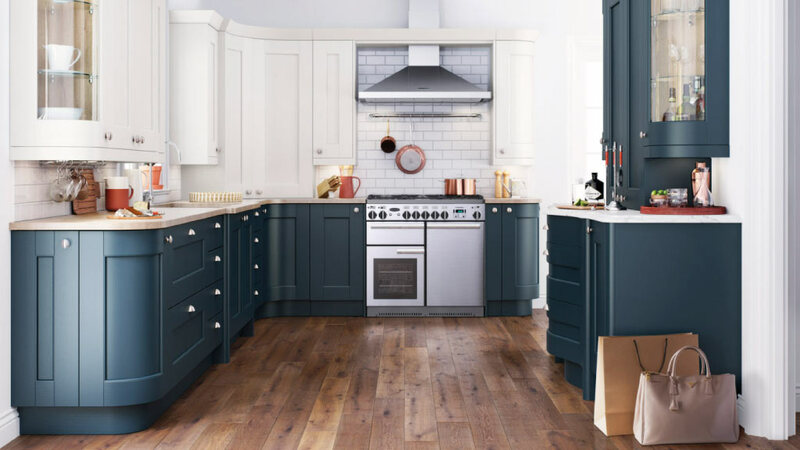 A high quality painted Shaker finish in the colour of your choice can really set this style into a new classic fitted kitchen or an old stone build. Why choose an MDF shaker kitchen door? Are you weary of cost? Do you want the overall look of a new shaker kitchen without the price tag of solid wood? There is one single most important determining factor when pricing a shaker kitchen design and that is material. Just like an expensive dress or suit versus it’s cheaper alternative, both achieve the same objective but are made from different materials. One may last longer, look better or just have more character about it that you happen to like. This is similar when it comes to kitchen door materials. So solid wood is great? well, sometimes. Solid wood looks great but it’s expensive by comparison to an MDF man made alternative and this is clearly reflective in a shaker kitchen cost. If you want the look without the cost of solid wood the MDF shaker kitchen doors are the right choice. As with all our shaker kitchen designs they can be painted in a great selection of standard colours. If you require something unique there is also the option of bespoke colours to choose from. Some detail but not too much to handle. Sometimes called a classic, this door is versatile and durable. A good quality handle really brings this door style to life. It’s popular for a good reason, it looks great and it works, if all else fails, go with the majority vote and stick with a winning formula that has already stood the test of time. The shaker kitchen doors have a clearly defined inset panel which creates a ledge for dust and grime to collect upon. This is unavoidable but not intolerable and some would say a small price to pay for the value it brings to the home. Smaller rooms with low light don’t gel well with a shaker door and all of its angles and ledges, if the room is tight you might find a high gloss kitchen or flat door such as a slab style or a handleless kitchen door style more manageable and less intrusive with the bonus of not soaking up the light source creating shadows.